Positively the most delicious hand, feet and body brand in the world. You will never forget the smooth silky textures, the delicious scents and the way you feel when one of our products touches your skin. With over 35 products in the range, Spalicious was created to deliver solutions for the whole body and is committed to the development of products that not only have a powerful effect on the body but also the mind as we live in stressed and busy environment. 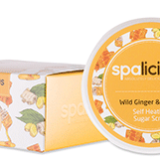 We at Spalicious believe in the holistic full body and mind treatment approach. Availability: Spalicious products are only available for purchase in salons. Contact The Spa Consultants for your closest stockist.